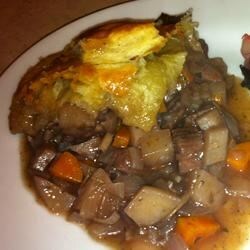 "This recipe has everything: beef and vegetables in a thick, savory sauce, served up with puff pastry. Nothing in the frozen food aisle comes close to this recipe!" In a large skillet, cook bay leaf, oregano, onions and mushrooms in olive oil until soft. Stir in garlic, carrots, celery, potatoes, and meat. Cook and stir for 10 minutes, or until meat starts to brown. Pour in wine. Bring to a boil, and reduce heat to simmer. Simmer for 35 to 45 minutes. Place in pie dish, sprinkle with parsley, and cover with pastry. Brush with egg whites. This was a little time consuming, but totally worth it! I increased the quantities of the veggies (almost double) and used a double pie crust vs. the puff pastry. It was delicious! Excellent recipe, great flavor! I did add some beef broth (as suggested) and added some cornstarch to thicken the sauce to more of a gravy. My husband loved it! Easy and elegant! Nice twist on a perfect comfort food. Used a merlot, needed salt, I felt, but that could be me. Loved it anyway! Thank you!